I tried to edit my question with more details and I also think that lot of people can benefit from this question! So I have manually calculated Geoid Height from this page: http://earth-info.nga.mil/GandG/wgs84/gravitymod/egm96/intpt.html and as alternative for not transforming decimal to degrees from third party there is also this page: https://geographiclib.sourceforge.io/cgi-bin/GeoidEval?input=44.97775%2C+14.73826&option=Submit. 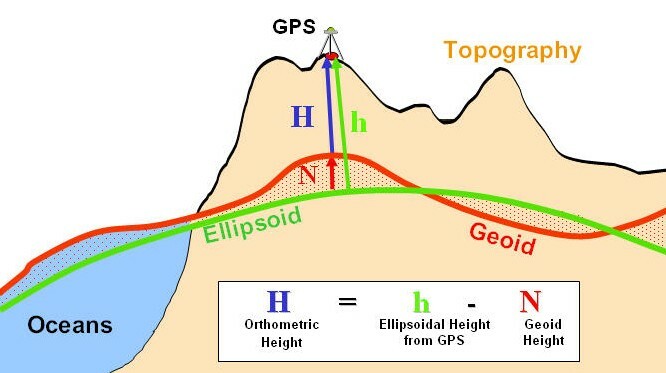 Now I am wondering how to calculate geoid height automatically in QGIS? People were mentioning that there is some sort of documentation for calculating geoid height on earth-info.nga but it is given in Fortran/C/?. In addition to that Google Earth have option that pops up on opening a file: Adjust altitudes to the ground level, which I assume it might be a possible solution for Google. So if Google Earth has it I guess there is some sort of plugin from QGIS too. Mobile phone that I have: Sony Xperia m4 aqua and I had High accuracy mode turned on. Specification for my phone can be found here: imei.info/phonedatabase/16958-sony-xperia-m4-aqua-e2303 (GPS: A-GPS/Glonass, GLONASS: No). My question was marked as duplicate, if it refers to my old question, I dont see it to be the same. My last question was about "why", this question is about "how". Browse other questions tagged qgis elevation altitude geoid or ask your own question. How to calculate elevation differences between points and terrain model?